It's Official! 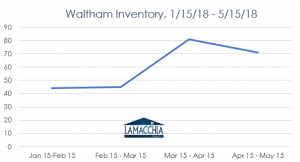 Inventory of Homes for Sale is Higher in All Areas Except…. Listing your home in the winter makes you more money. We talk about this all the time and this year is no different. 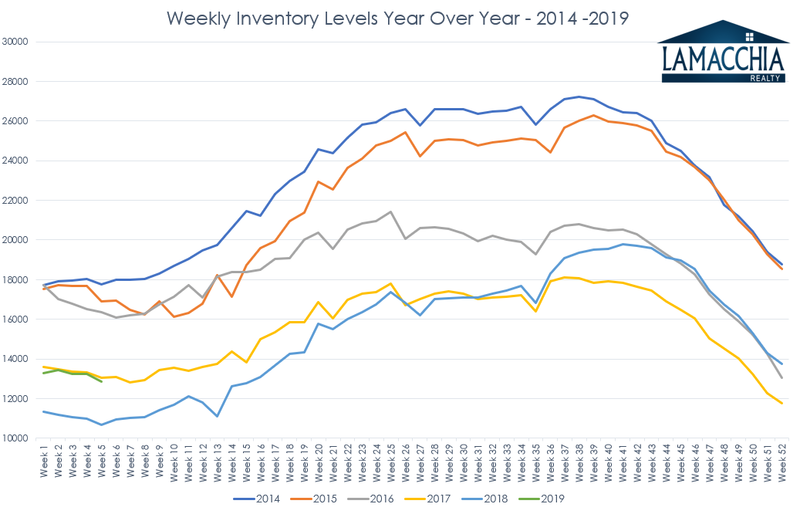 Despite an 18% increase over 2018, when the inventory of homes for sale had never been lower, inventory is still lower now than it will be all year. As you can see in the graph above, this is the first time in 6 years inventory is higher than the year before, but it’s likely to follow the same path that it always takes: lowest in winter, increases in spring until it peaks in mid to late summer and then by fall, it drops dramatically. See below. Though this year the path has started at a higher point, it’s likely to follow the same trends that we’ve seen for the past 5 years. Inventory levels directly correlate to the seller’s market vs buyer’s market phenomenon, when the market shifts in and out of favor depending on the season. We explained this deeper in May in our blog Don’t Worry Buyers, This Won’t Last Forever which addresses buyer frustration in a seller’s market. 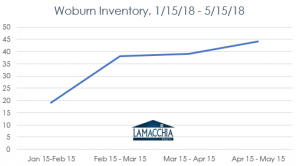 Inventory and the number of buyers translates to supply and demand, and in real estate the rules are the same as anywhere else. The more supply there is, the more buyers have to choose from and the more they can negotiate on price terms, making it a buyer’s market which we tend to see in the last month’s of the year. 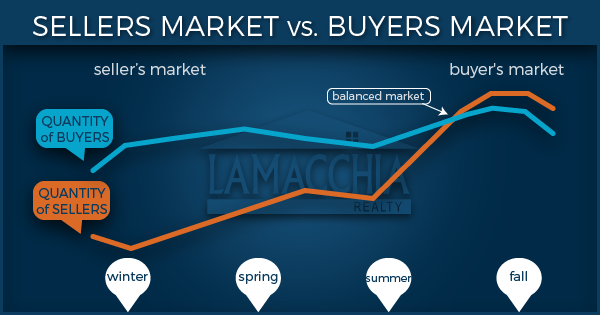 Less supply and more buyers give the sellers the upper hand which is exactly the state of the current market and the supply of buyers will only grow larger in the weeks ahead. 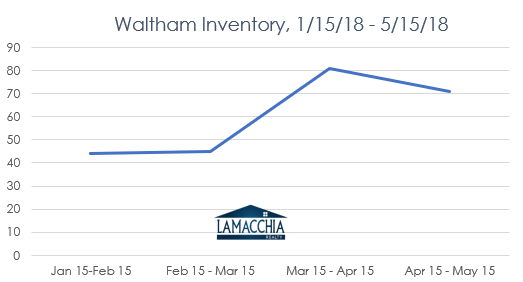 Yes, there are a good number of buyers out there, but they aren’t out in droves yet. However, they will be within weeks as buyers always come out earlier than the majority of sellers and that is exactly what creates this imbalance. 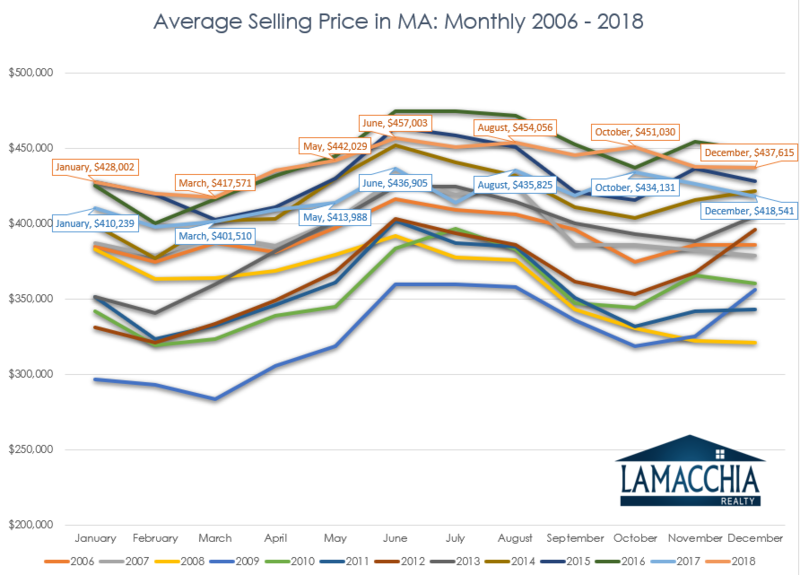 This explains that when homes placed under agreement in the late winter/early spring end up with higher sales prices than if they go under agreement in the late spring/early summer. Buyers are willing to pay more to secure a home when inventory is low and competition is high. 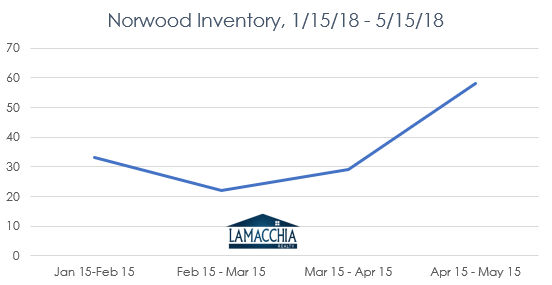 In the graph below you see the spike in average selling price in early summer because those homes accepted offers in early spring and then closed around June due to the delay between those two steps. Notice in the graph below, as well, that 2018 prices (orange line) are much higher than 2017 prices (blue line) throughout the entire year. 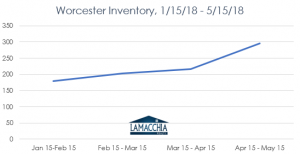 Home sellers, particularly New Englanders, tend to think that selling in the spring or summer when flowers are blooming, and the sun is shining makes their home more appealing. But that’s not how it works- a home is more appealing when it’s the only one available in the neighborhood in the buyer’s price range. That is what sells homes. If selling in the first half of the year is your plan, we strongly urge you to consider to begin to prepare your home for a Winter Sale now. 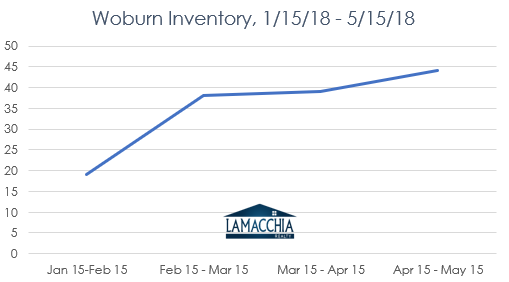 The optimal time to list every year is usually anywhere between January 20th and March 15th when inventory is the lowest. As recently predicted in Anthony Lamacchia’s Housing Predictions for 2019, inventory levels are going increase a bit over 2018 so buyers are going to have more control in the market. 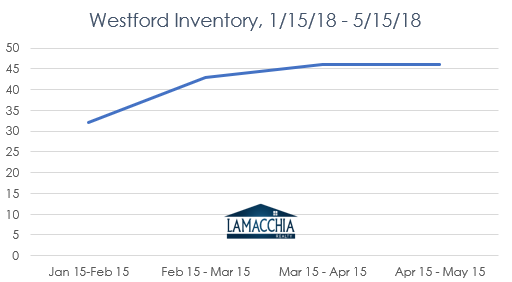 This increased inventory has already begun to show its face, so sellers should take our advice and take advantage of the lowest inventory we’ll see all year and sell for more money!